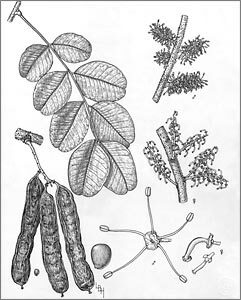 The botanical illustrations collection at the University of Arizona Herbarium contains several unpublished drawings by artist Lucretia Hamilton. A number of these works were prepared for an allergenic plants publication that Hamilton was working on with Dr. Ervin Schmutz, Professor of Range Management at the University of Arizona and Hamilton’s co-author of Plants that Poison. These drawings, produced near the end of Hamilton’s career, show the masterful control that she had achieved with the pen and ink medium. Compositionally, the works are superb. The book was never completed, and Hamilton’s illustrations have not been widely viewed. 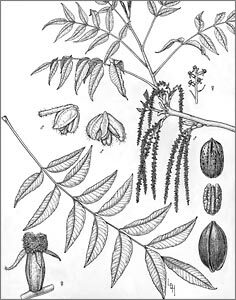 Shown here are drawings of the carob and pecan trees, both heavy pollen producers. This appeared in the September 2016 issue of The Desert Breeze, the monthly newsletter of the Tucson Cactus and Succulent Society.